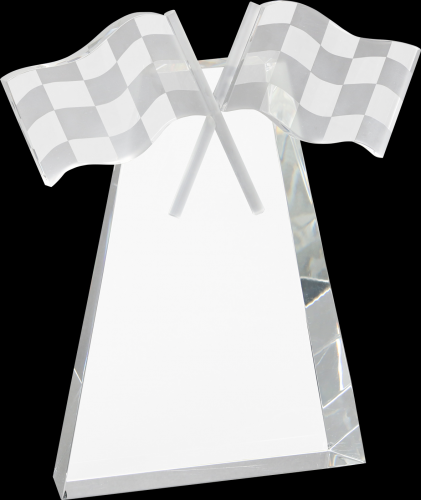 These Crystal Racing Flags awards are ideal to recognize the ultimate for your next racing event These awards are made of heavy optical crystal and have two highly detailed checkered flags crossing on top of the award. They are available in your choice of three different sizes, 7" X 6" X 2", 8 3/4" X 8" X 2"and 10 3/4" X 10" X 2". Each of the sizes provide plenty of space for whatever your personalization needs might be. All crystal awards can be laser engraved or sandblasted. A handsome fabric lined presentation box is also included with these items. Imagine the expression of the person when they see their name on one of these impressive awards.